The change in billing was brought to light by users on Reddit and a subsequent report by iPhone in Canada, the latter of which notes iTunes Store customers recently began to see fees applied to iTunes purchases. Depending on a user's location, Apple is tacking GST, HST, PST or QST onto iTunes transactions. Tax collections, which also apply to Apple Music subscriptions, appear to have commenced on the first of the year. Apple failed to publicly announce the tax change, prompting reports from customers in the region who found invoice pricing did not match iTunes listed rates. 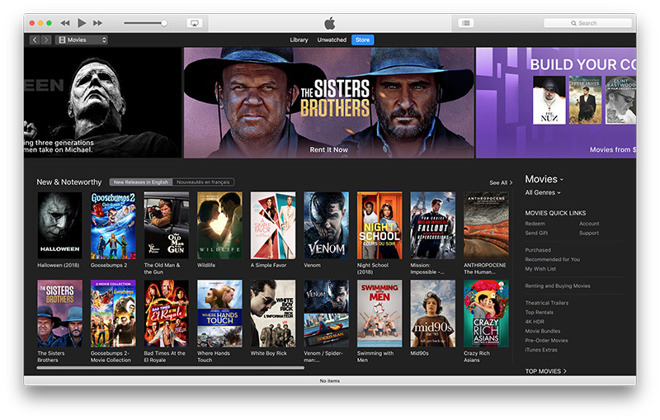 As it does in the U.S. and other areas, Apple does not price Canadian taxes in to iTunes content listings, meaning the final cost of a CA$4.99 movie might come out to CA$5.59, depending on purchase origin. Apple clarified the situation to Rene Ritchie, who shared a comment from the company as part of a tweet on Monday. "As the world's largest taxpayer, we respect the important role taxes play in society," Apple said. "Due to recent changes in Canadian legislation and the growth of our business, sales tax will now be charged on purchases of TV, movies, music and audiobooks." Prior to the updated iTunes policy, customers in Canada were subject only to taxes on App Store purchases. Well you want APPLE to pay taxes. Like every corporation, they don't pay the taxes, YOU DO. So it's just another round about way to tax the people. See the politicians look good, they're out there going look at me going after Apple not paying taxes, which they are, and now we're making them. No you're not!!! You know they aren't. They just pass those costs right on to YOU. Because so many people are just DUMB at how much the government steals from you in taxes. This is the round about way they do it. Generally they don't want to flat out say they want higher taxes on YOU, the poor and middle class. We're going to get those EVIL Rich Company's. No, in the end it's really YOU getting taxed. It's only FAIR that Canada should pay their TAXES. "As the world's largest taxpayer, we respect the important role taxes play in society," Apple said. Do Canadian Spotify users have to pay tax now, too? It seems like they would if this is simply a change in the law and if that’s the case the news isn’t really about Apple at all. Yes it applies to Spotify digital streaming too. It has nothing to do with Apple specifically, it's a consumer-side tax similar to US sales tax and EU VAT. Apple doesn't pay the taxes but is simply a collection agent for the Canadian provinces. The headline indicates as much. As with US states the rate will vary from province to province. Well you want APPLE to pay taxes. Like every corporation, they don't pay the taxes, YOU DO. So it's just another round about way to tax the people. I never really noticed the lack of sales tax on Apple digital products (though now I do) but have noticed that Sony digital purchases for the PS4 were all tax-free. I couldn't quite figure out why, so I suspect that this gravy train is over now too. Too bad, as I would have bought a couple of things last week if I had known. I assumed the posted price included the tax, which resellers are free to do if they wish. I had no idea we weren't paying tax at all. Just look at a simple supply and demand graph and you'll see that once the price goes up, demand goes down and most of the digital services that Apple sells have elastic demand curves. Yes, Canadians are paying some of that tax but if Apple wants to continue generating the same revenue, it has to accept a reduction in its margin, i.e. it is also paying those taxes. If governmental agencies decide to levy taxes on digital content, I hope the creators reap a benefit, as they have been ripped off to varying degrees by every middleman involved in the creation and delivery process for over a century. You are correct, this is not really about Apple. It is about us. What's different now is that Canada is now requiring Apple to collect taxes on transactions that users should have been paying on their own. The fact that a retailer does not collect taxes as part of a transaction does not free the purchaser from paying all taxes that are required in their place of residence, e.g., country, state, county, city, etc. A small number of consumers are legitimately clueless about sales taxes and use taxes. Far more consumers actively choose to remain clueless about sales and use taxes to maintain an illusion of deniability while committing tax fraud. If you purchase a product, say a $2000 iMac from B&H Photo in New York and they do not charge you sales tax because you live in a state that they do not collect sales taxes for, say Tennessee, you are personally responsible for paying use tax to the state for that purchase. If you do not pay the tax you are committing tax fraud. In essence, retailers that boldly proclaim "No Sales Tax for purchases outside of NY" or something to that effect are enticing you to at least consider the option of committing tax fraud against the state that you live in to make you believe you are circumventing taxes. They can do this because it makes their store more attractive, they have no obligation to collect taxes for your state, and if you don't pay the taxes that you are required to pay in your state, hey it's all on you. Regardless of anything related to the relationship between the retailer and the states, you are always required to pay the taxes even if the retailer is not obligated to collect them. Of course the vast majority of consumers know this, but choose to ignore it because the probability of getting caught is low. This is why taxing agencies at all levels are trying to enact new laws that no longer rely on individual compliance with tax laws. So Apple is essentially getting burdened with a requirement to serve as a tax collector for countries and states because we cannot be trusted.